A refugee camp is a camp set up specifically for the housing of refugees from another country. Refugee camps are most often set up when there are large numbers of refugees fleeing a particular country and entering into another particular country. The country to which the refugees are fleeing might not have immediate accommodations available for such a large influx of refugees, and as a result, refugee camps often spring up out of necessity. 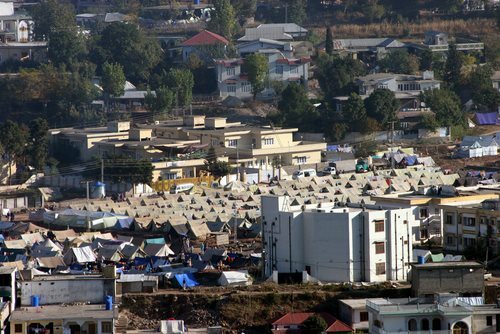 Refugee camps are often built by the United Nations or other organizations which are attempting to help refugees by providing them with some form of shelter while they either are formally processed by the nation granting asylum, or while they await the ability to return to their home nations. Even when refugee camps are set up by such organizations, however, they are generally not safely inhabitable for an extended period of time. Refugee camps cannot generally be set up with much preparation, and thus they are only designed to provide the most basic and elementary of benefits of shelter, meaning that they are often unhygienic and even potentially dangerous if inhabited for any extended period of time. It is instances such as these, when the refugee camps are very unsafe for their denizens, that refugee camps can become a significant issue to be dealt with for the sake of those refugees forced to live in the camps. There are some instances in the world of refugee camps which have existed for many years, or even decades, further emphasizing the potential problems of refugee camps.